From the Royal Albert Hall, London. Gilbert and Sullivan expert Charles Mackerras conducts the BBC Concert Orchestra in Part 1 of a semi-staged version of the operetta Patience. From the Royal Albert Hall, London. Presented by Martin Handley. 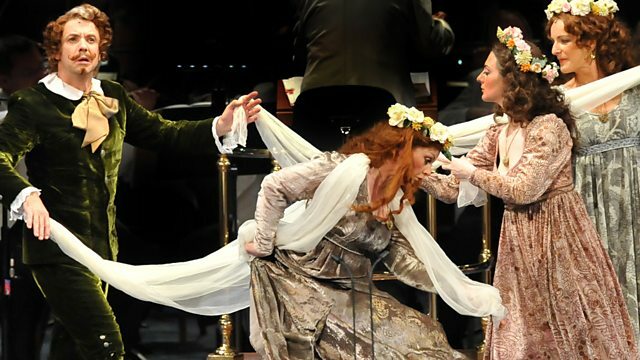 Charles Mackerras is an acknowledged expert in the music of Gilbert and Sullivan and he returns to the Proms to conduct a performance of the exuberant operetta Patience. Patience opened the famous Savoy Theatre in London in 1881 - the first theatre in the world to be lit by incandescent electric light - and it satirises the fad of the 1870s and 1880s known as the 'aesthetic craze', when poets, painters and composers were prolific but, some argued, empty and self-indulgent. It centres on Patience, the simple village milkmaid, who cares nothing for poetry.